Will Francome was born on 9th of December 1981 in the United Kingdom. The same night, in Philadelphia, a black journalist, former member of the Black Panther party, was arrested for the murder of Daniel Faulkner, a police officer. His name: Mumia Abu-Jamal. While William grew up in a white middle-class suburb, Mumia Abu Jamal became a leader from death row, claiming his innocence and fighting against all injustices, the voice of the voiceless. When he was 25 years old, William decided to investigate Mumia Abu-Jamal’s story and soon uncovers that case for reasonnable doubt in the trial had been overruled for discutable reasons. The documentary film is the result of the investigation. The first ever documentary to be awarded the Amnesty International Secretariat stamp for the accuity of its research, In Prison My Whole Life was selected to numerous film festivals, including Sundance, Roma, London, Geneva... 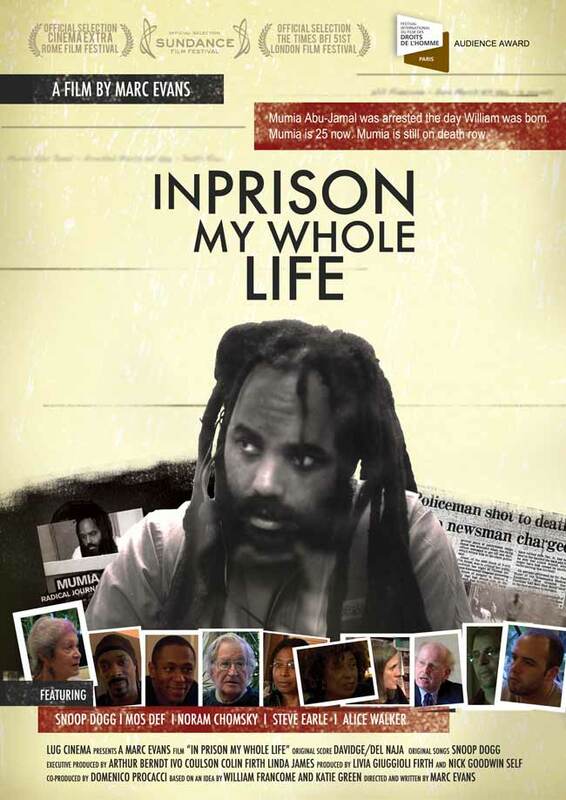 It won awards at the Paris and Geneva Human Rights Film Festival, at the Berlin Black Film Festival... Click to watch In Prison My Whole Life online or order the DVD. In Prison My Whole Life - Trailer from Lug Cinema on Vimeo. You can watch In Prison my whole Life online by clicking the "watch now" button of the player. Mumia Abu-Jamal (born Wesley Cook on April 24, 1954) is an American journalist convicted for the murder of Philadelphia police officer Daniel Faulkner in 1981. He has been described as "perhaps the world's best known death-row inmate" by The New York Times. Supporters and detractors have disagreed on his guilt, whether he received a fair trial, and the appropriateness of the death penalty. This latest point was settled by the justice system in 2011, when the original sentence of death, handed down at his first trial in July 1982, was commuted to life imprisonment. Born in Philadelphia, Mumia Abu-Jamal became involved in black nationalism in his youth, and was a member of the Black Panther Party until October 1970. Alongside his political activism, he became a radio journalist, eventually becoming president of the Philadelphia Association of Black Journalists. On December 9, 1981, Officer Faulkner was shot dead while conducting a traffic stop on Abu-Jamal's brother, William Cook. Abu-Jamal was injured by a shot from Faulkner and when further police arrived on the scene, he was arrested and charged with first degree murder. Going on trial in 1982, he was convicted by jury and sentenced to death, spending the next 30 years on death row. In 2008, a three-judge panel of the U.S. Third Circuit Court of Appeals upheld the murder conviction but ordered a new capital sentencing hearing because the jury was improperly instructed. Subsequently, the United States Supreme Court also allowed his conviction to stand, but ordered the appeals court to reconsider its decision as to the sentence. In 2011, the Third Circuit again affirmed the conviction as well as its decision to vacate the death sentence, and the District Attorney of Philadelphia announced that prosecutors would no longer seek the death penalty. He was removed from death row in January 2012 and in March 2012 the Supreme Court of Pennsylvania ruled that all claims of new evidence put on his behalf did not warrant conducting a retrial. Since early 2015, Mumia Abu-Jamal's health has deteriorated, due to what has been later diagnosed as Hepatitis C. Would this condition not be properly treated, Hepatitis C could be fatal. In August 2015 his attorneys filed suit in the US District Court for the Middle District of Pennsylvania upon the allegation that he has not received appropriate medical care for his health conditions. The suit was rejected in October 2015. Mumia Abu-Jamal's Hepatitis is, according to his friends and supporters, still not properly treated, and they fear this would be equivalent to a hidden death penalty. During his imprisonment he has published several books and other commentaries, notably Live from Death Row (1995), in which he dealt with social and political issues. Courtesy of Amnesty International and Wikipedia.